Red Bull Racing have confirmed they will extend their relationship with Aston Martin. The team will race as Aston Martin Red Bull Racing from next season as the automotive firm takes over as lead sponsor. The pair combined to produce the Aston Martin Valkyrie hypercar, with the expanded technical partnership taking concrete form in the shape of a new Advanced Performance Centre being established at Red Bull Racing’s campus later this year, creating more than 100 jobs. The new Centre will create 110 new jobs housing Aston Martin’s design and engineering personnel responsible for future sports cars from the two companies. The new centre will allow a closer working relationship between the two leading brands in their respective fields which will see the adoption of both F1 and road car technology. Christian Horner, Team Principal of Red Bull Racing said: “Our Innovation Partnership with Aston Martin has been a pioneering project from day one. Having conceived and created the remarkably successful Aston Martin Valkyrie together in 2016, we extended our relationship this year and are now delighted to further strengthen the partnership and see the team competing as Aston Martin Red Bull Racing in 2018. 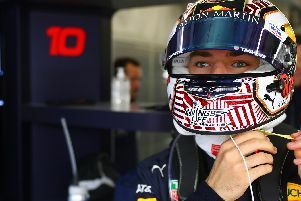 Aston Martin President and CEO, Andy Palmer, added: “Title partnership is the next logical step for our Innovation Partnership with Red Bull Racing. We are enjoying the global brand awareness that a revitalised Formula One provides. Aston Martin will feature prominently across the Aston Martin Red Bull Racing team from the start of the 2018 season.